Your stereo breaks. A charming old radio stops tuning in the NPR. Your niece's band just put out its first record - on vinyl - and you need to get that old turntable humming again. What do you do? Where do you go? Do you have to buy everything new? Not at all, my fellow Caledonian. Just head to Globe Electronics, where proud proprietor Voltan Bagot will hook you up. Yes, that's his real name. And I think of him more as a professor than proprietor (especially when he's wearing that neat & clean white smock). The guy has chops; he can fix anything. 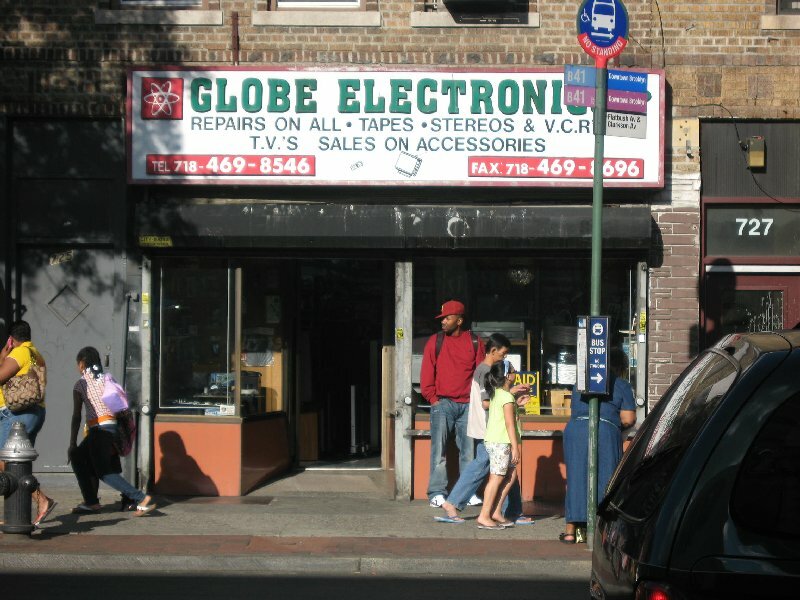 He learned his trade back in Guyana, and his shop has stood on Flatbush between Parkside and Clarkson for 30 years. A family man, he also serves as Secretary for the Flatbush Avenue Business Improvement District. And his window display is truly a work of art. Early on when I moved to "the Q at Parkside," I started having trouble with the hi-fi. My Marantz receiver from the 70's was on the fritz, but going to J&R is such a bummer I couldn't bear the thought. The new equipment may be shiny and black with computerized settings and slick styling, but it's all plastic, and it can't hold a sonic candle to the old gear. I'm not being cute or hipster here (though I've been accused of being both). A/B 'em sometime and you'll be amazed at how right ol' Clarkson FlatBed can be. When you live in a quirky neighborhood like ours, it's easy to dismiss stores as outdated, superfluous or clueless. I know, because I fall into that trap all the time. But GLOBE ELECTRONICS stands out, both because it provides a needed function and does it with class. And where else are you going to buy a used TV from 1987? Well not to be Debbie Downer but we didn't have the best luck trying to give this store some business. When we first moved in, our 5 changer dvd player suddenly stopped working so we brought it into him. He charged a 20 dollar deposit, and every time we went in to see what was wrong and if he had fixed it, he said he needed more time to get the thing for the thing cause the thing was broken and things. We are talking like every week or so checking in with him and him saying to come back come back he was still waiting for the thing for the thing. oy. So finally after no joke like SIX months we just went in and asked for our lemon and our 20 bucks back and of course the "other" guy had no authority to give us our money back even though we had a little receipt for the deposit and he knew who we were. Sad face. Would like to join you in saying positive things about a neighborhood biz but a gal's gotta be honest about her experiences right? He fixed my piece of junk TV-VCR in a timely manner and on a side note I pleaded with him to let me buy an old 60's Pilot tube receiver that appeared to be a long standing ongoing project with him. He finally let go and said "I hope you get a good price for it" I assured him that it had now become my project (audio nerd that I am) and would probably be spending countless hours getting it to speed for my own enjoyment....nice guy. Parkside "Canners" - Right or Nuisance? I've Died and Gone to (Closeout) Heaven! Clarkson Beautification Day - THIS SUNDAY!